Даже интересно, что SIG SAUER припас к 2019. На Shot Show буду работать, узнаем. А пока, очередные поздравления 365-ому. 2018 NASGW Leadership Award for “Innovator of the Year”: NASGW Leadership Awards are given to association members that exemplify a commitment to two-step distribution in the sporting goods industry and provide outstanding value and service. Nominees for the NASGW Leadership Awards are evaluated on four key criteria: 1) distribution policy, 2) marketing, 3) sales and promotion, 4) logistics and operations and NASGW and industry support. 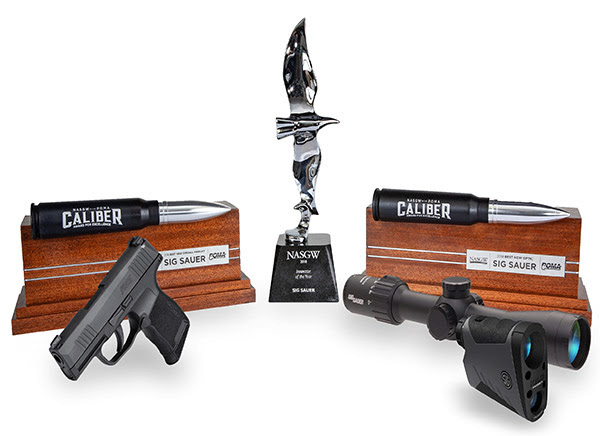 The SIG SAUER Electro-Optics Ballistic Data Xchange System (BDX) and the SIG SAUER P365 pistol were each honored with a 2018 NASGW-POMA Caliber Award. The NASGW-POMA Caliber Awards are a partnership between the (NASGW) and the Professional Outdoor Media Association (POMA) to recognize new and innovative products within the sporting goods industry for the year. Products are submitted by manufacturers for each category and evaluated on the following criteria: uniqueness, market need, the value of the product, ingenuity, and presentation. 2018 NASGW-POMA Caliber Award “Best New Optic”: Since its introduction in May 2018 the SIG SAUER Electro-Optics Ballistic Data Xchange (BDX) system has earned multiple industry awards and can now count the 2018 Caliber Award for “Best New Optic” as one of them. BDX is a fully integrated rangefinder and riflescope system that utilizes Applied Ballistics and Bluetooth™ to calculate and illuminate the exact holdover dot for the perfect shot. BDX is simple, fast, and intuitive – just connect the dot. The SIG BDX app is available for Android or iOS devices. 2018 NASGW-POMA Caliber Award “Best Overall Product”: The SIG SAUER P365 earned the highest honor amongst the 2018 NASGW-POMA Caliber Awards for “Best New Overall Product”. The P365 is an everyday, concealed carry pistol. The high-capacity, micro-compact pistol is smaller and lighter than other pistols in its class. It features a patented, modified double-stack magazine for a 10+1 full-size capacity, with a 12-round factory-made magazine available for 13-round capacity.